Keep the roads in and around your business, warehouse, or loading dock safe. Workplaces often have continuous foot traffic throughout the day. Speeding drivers are too great a risk to be ignored. But how can you make them slow down? Speed cameras are a proven strategy to slow vehicle speeds. That’s because no one likes to be penalized. And of course no one wants to spend their hard earned money on fines. Enforcement Logix technology gives you real-time images of speeders’ license plates. Violators then receive automated warnings by mail. And with the Enforcement Logix Cloud, you get insight into when and where speeding is an issue. Protect your workplace and the streets around it with speed cameras that do the work for you. The Guardian speed camera system works with the SafePace speed display sign of your choice. Drivers first see their speeds displayed. Flashing digits, strobe lights, and/or messaging alert speeders to slow down. 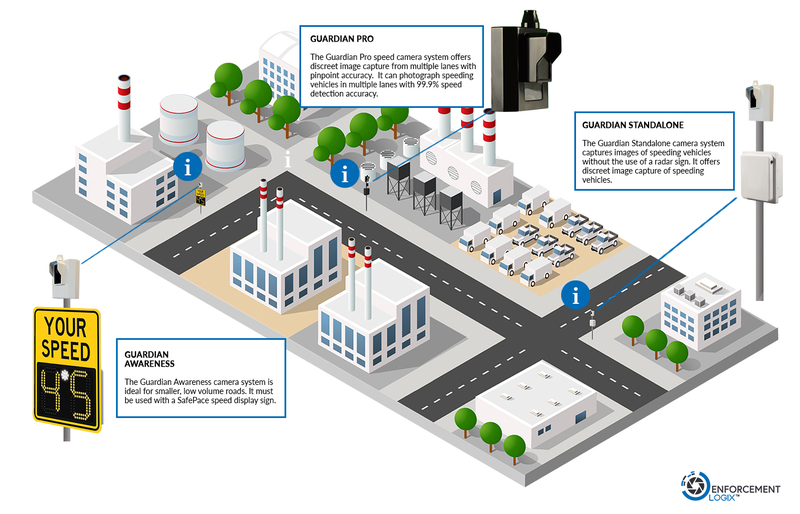 The Guardian camera simultaneously detects vehicle speeds, captures precise license plate images, and uploads all violation data to the cloud. You can then access speed data from anywhere, anytime. Protect the roads in and around your workplace. Ensure that speed limits are observed. And keep your workers safe. Try the Guardian camera system today.